Around this time of year, the holiday gift catalogs start filling our mailbox. The kids love to pore over them, marking all of the items they want for the holidays. My older kids also find their way to Amazon, Toys R Us and other favorite retailer sites in search of items for their wish lists. In recent years, I've set up a single wish list on Amazon that I compile with the kids' input and share with relatives seeking gift ideas. This year, I'm planning on letting my kids do more of the legwork for me by setting up wish lists that can hold items from any site. That way my daughter can pick out earrings on Claire's while my son finds weapons (real and toy) on Amazon. I won't be sharing their personal lists with the relatives, otherwise I might find a Wood Crossbow with Scope and Pack of Metal Arrows under our tree, but I do expect they will spark some ideas and keep the kids busy. And, I'll be creating my master list from their lists. The best wish list sites have a toolbar add-on that you can click to add items while browsing. Once the button is installed, you click on it from an item page and that product will appear on your list with an image, pricing and link to the retailer. Other features to look for are price-change notification, holiday-themed templates and Facebook and Twitter sharing. If you're looking for a simple list-maker with a clean interface, Wishpot gets the job done. Like all good list-making sites, it has a toolbar add-on and it is a pleasure to use. Clicking on the Wishpot icon brings up a window prefilled with the product's name, price, image and link. You can edit these and then select the wish list you want to add the item to, the recipient's name, number needed, tags, notes and a priority level. For some items and retailers, you can also choose to be alerted if the price drops or deals on the item come up from other retailers. 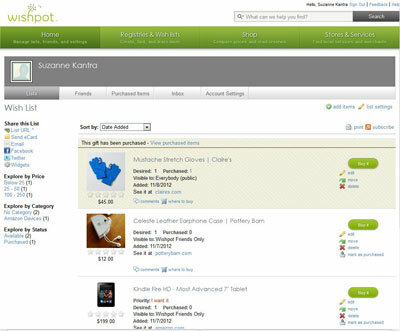 For those buying from your wish list, they can sort by price, date added and whether an item is available. And if they buy an item, they can indicate that they've purchased it so you don't end up with duplicates. Amazon also has a good wish list that lets you easily add items from its own and other sites. For Amazon items, you select "Add to Wish List" instead of add to cart. For other sites, there's a toolbar add-on that captures basic information, including a picture, item name, quantity and your comments. Once you open your wish list on Amazon, you can add a priority to the item. Using the Amazon Mobile app (free in iTunes, Google Play and Windows Phone Marketplace) you can access your wish lists on the go. When browsing an Amazon list, you can sort by the product category, date added and whether an item has been purchased. When purchasing through Amazon, the item will be automatically marked as purchase. 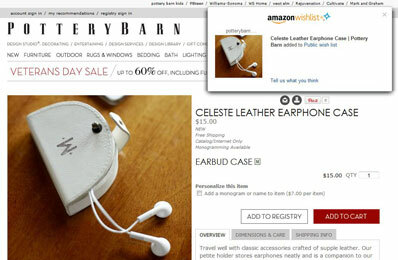 For items from other sites, you can mark an item as purchased. TallWish has group sharing options not found on other wish list sites. You can add items secretly to other people's wish lists so family members can collaborate on ideas. The name of the person suggesting the item appears next to it. And when an item is purchased others in the group can see, but the wish list owner isn't notified, so gifts can remain a surprise. It's a little bare bones, though, when it comes to adding items; there is no tool-bar add-on and you can only manually enter the item name, link and priority level.